Collin (Daveed Diggs) and Miles (Rafael Casal) have been best-friends for as long as they’ve remembered. They live in Oakland, have seen a lot of change, and have seen a lot of stuff continue on, day-in and day-out. It’s what gets them by in a world that is constantly getting more and more divided, and at that, crazier. But it’s looking up for Collin who is also finishing up his final three days of probation and is hoping that it all goes down without a hitch. Then, one fateful night, when he’s stuck at a red-light, he sees a cop (Ethan Embry) shoot a suspect in the back. Collin, shocked and clearly distraught, drives away and doesn’t try to think too much about it; even with all of the news-reports and constant tributes to the fallen-citizen, Collin thinks that it’s best to continue on, not cause any issues, and finish up his probation, once and for all. But Collin is clearly messed-up and disturbed by this deadly moment in his life and it can’t help but make him look deeper into all aspects of his life. Blindspotting is so clearly a film from a first-time film-maker. It’s brash, loud, arrogant, crazy, overly-stylized, original, and most definitely a mess. It has a lot to say and a very loud voice to say it with, but at the same time, it also doesn’t know how to make all of its thoughts, ideas and feelings come out in a manageable, cohesive way. It’s basically listening to someone at a bar, ranting and raving about all that they think is wrong with the world we live in, with a lot of interesting points, but no real transition from one to the next. Except that Blindspotting is, like I said, much more engaging and thoughtful than that ill-advised conversation. Director Carlos López Estrada takes a script co-written both by Diggs and Casal and gives it plenty of fun and flair to go along with the sometimes sad and drab location. Cause as we all know, Oakland, as well as other certain cities in certain states, is going through a bit of a change; gentrification is coming in hot, what’s old is new, and there’s lot of clashing going on. Blindspotting clearly has a lot to say about this and often times, it can tend to be a bit too much, but really, where it’s heart and soul lies is within these two characters, how they relate to the world around them, and why they are who they are because of it. In a way, Blindspotting is a much better drama than comedy, because it actually gets deep and down with the male-psyche, especially that of an African-American. Through Collin, we see a beaten-down and broken man who has gone through the ringer with the system and is trying to make amends for his past misgivings; as we see, it’s not always easy and it takes its toll on Collin. He starts to lose his sense of composure, what’s real, what’s wrong, and in a way, “get woke”. Covering a child’s ears in 2018 almost seems dated. Sorry. I had to coin that phrase eventually. But seriously, that’s what happens with Blindspotting and it’s when it decides to stop being so silly and jokey, and actually start to get serious for a change. Sure, the constant ranting and raving about gentrification and why it’s such a joke in the first place never ends, but it takes a far more sad and sinister tone as we start to see more shadings to the characters of Collin and Miles. Together, Diggs and Casal have a great bit of chemistry where you can tell that they are best-pals who love and respect one another, yet also, hold so many reservations against the other, it’s almost too obvious. When it all does come flying out, it’s jarring and scary, just as well as it would be with any best-friend who you’re telling is also a bit of a piece-of-a-s**t.
And eventually, Blindspotting turns into a rage-filled speech against racism and the political divide that’s been prevalent in American since the dawn of time. It’s smart and it’s impactful, which makes the rest of the movie work in-comparison, but like I said, there’s still a lot here to learn and work from. Next time, though, count me in. 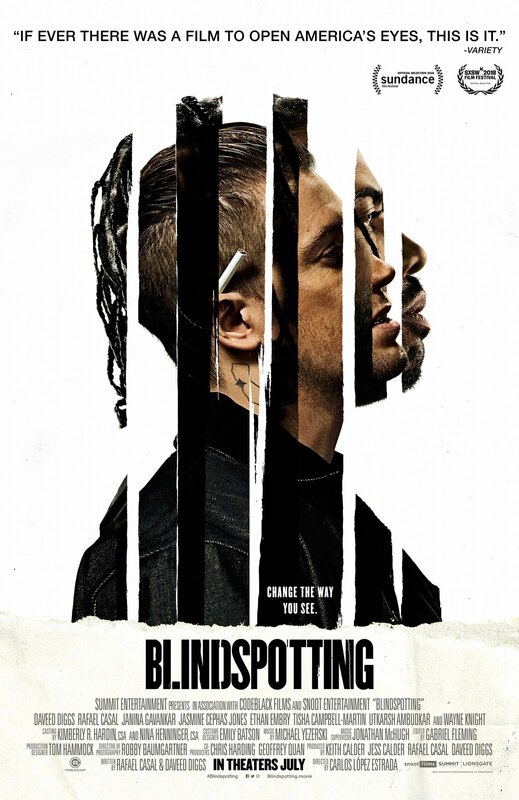 Consensus: With so much to say, Blindspotting almost feels like a long-form rant, but still gets by as a compelling, thought-provoking, and sometimes smart look at our changing times and the way racism still exists no matter which way you decide to look at it, or not. Just be friends, guys. Do it for America.